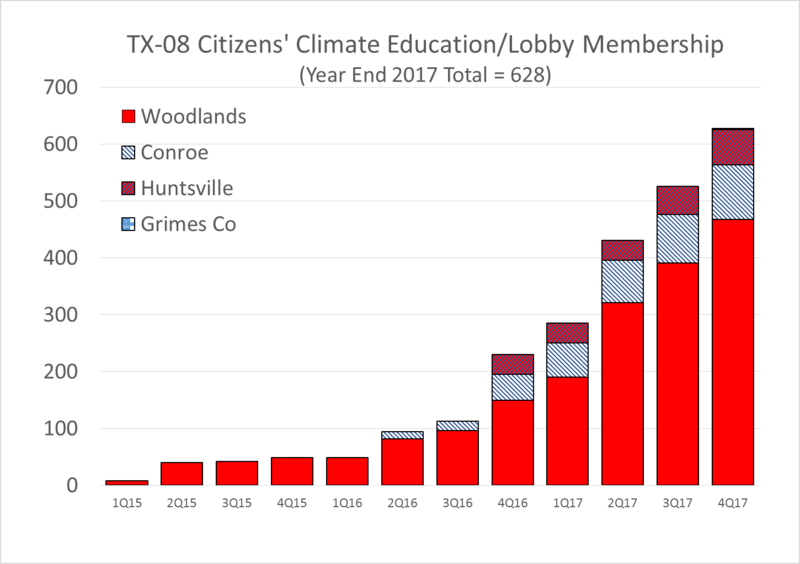 Since it first kicked off in March of 2015 with 8 members, The Woodlands Chapter of the Citizens’ Climate Education/Lobby has grown significantly. This grassroots organization, focused on helping citizens create the political will to address climate change, ended 2015 with 49 members. By the end of 2016, those numbers tripled to 150. In Chairman Brady’s Texas District 08, there are now four chapters with 628 members at the end of 2017. That is more CCE/L members than any other US Representative’s District in Texas! Citizens’ Climate Education/Lobby are intentional grassroots education and lobbying organizations. They have one rule: Treat everyone, even those who oppose them, with respect, appreciation, and gratitude. Both organizations are nonprofit; Citizens’ Climate Education is a 501(c)3 organization and Citizens’ Climate Lobby is a 501(c)4. They are non-partisan organizations, determined to build relationships with everyone. Citizens’ Climate Lobby has one goal: to generate the political will for the United States Congress to enact Carbon Fee and Dividend legislation. Carbon Fee and Dividend is a market-based solution that will reduce our greenhouse gas emissions efficiently. The Carbon Fee starts at a low level ($15 per metric ton of CO2 emissions) and then increases steadily by $10 per year, allowing our industries and entrepreneurs the time to invest in increased energy efficiency and cleaner energy alternatives. The Dividend returns 100% of the net revenue to our citizens on a per capita basis, which keeps the money out of the government’s bureaucracy. George Shultz (a member of CCL’s advisory board) says this about Carbon Fee and Dividend: “It’s not a tax if the government doesn’t keep the money”. Returning the money to households means the Carbon Fee and Dividend actually grows the economy. The policy includes a border adjustment to protect American manufacturers, and exporting our carbon price around the world. This cartoon was first published in the Houston Chronicle during the Paris Climate talks when ExxonMobil came down to tell the Chronicle what they knew: climate change is real, the risk is real, and government should take action. The Oil & Gas Majors are sophisticated Earth Science companies. They are not going to advocate for carbon pricing unless they know that Climate Change is Real, The Risk is Real, and our Government Should Take Action. A quantitative study by Regional Economic Models, Inc. (REMI) analyzed the effect of a revenue-neutral carbon price policy on the American economy in their report “The Economic, Climate, Fiscal, Power, and Demographic Impact of a National Fee and Dividend Carbon Tax.” The report shows that a Carbon Fee and Dividend will actually grow jobs and GDP over the base case. This REMI report can be found at https://citizensclimatelobby.org/remi-report/. As Rex Tillerson said in a December 2016 interview regarding climate change, “Most of the public discourse is at both extremes … the solution is going to be found by thoughtful people coming into the middle.” Citizens’ Climate Lobby’s Carbon Fee and Dividend is just such a solution in the middle that makes economic sense. We, the Citizens, need to generate the Political Will for our members of Congress to enact it. Washington is also changing. The bipartisan Climate Solutions Caucus of 70 members (35 Republican and 35 Democrats) is one of the larger caucuses in the US House of Representatives. The growing support for real and reasonable action on climate change is growing but Congress still needs more support from voters to take action. The Woodlands is in US Representative District Texas 08 and our Congressman, Kevin Brady, is Chairman of the Ways and Means Committee. In that position he is key to passage of a Carbon Fee and Dividend Bill as it will need to be considered by the Ways and Means Committee before moving on the full House of Representatives. If you are interested in helping to encourage Chairman Brady to reduce carbon emissions in a fair, responsible, and achievable manner, please consider joining Citizens’ Climate Lobby at http://citizensclimatelobby.org/ —it’s free. You can also attend monthly meetings on the second Saturday of every month. The meetings include education, national actions, and local actions. The next meeting is Saturday, March 10th, 11:30 - 2pm at Houston Advanced Research Center, 8801 Gosling Road, just north of Research Forest Drive. When it comes to the incorporation studies currently being done in The Woodlands Township, one of the most common statements members of the township’s board make in relation to the process is the need for transparency. Throughout the more than 14 months that the studies have been going on, questions have arisen about access to documents and reports about the data being analyzed. The issue of how to handle the law enforcement needs for The Woodlands if the community does incorporate has gradually taken center stage as arguably the most debated, and criticized, element of the more than year-long incorporation studies. The Woodlands Township board of directors said more time is needed before its incorporation study can yield conclusive answers about issues such as the cost of law enforcement services, but members of the board reiterated incorporation itself is not likely to go before voters this year. “The Woodlands area has a very active cultural arts community with many offerings throughout the year,” township Director Ann Snyder said. “In my opinion, the market for the arts is large and growing in The Woodlands and surrounding areas. It appears there is a definite need and demand for cultural arts facilities.” To address the increasing demand for cultural arts, the township is nearing completion on a study to determine if an arts center and natural science museum could succeed in The Woodlands. Nick Wolda, president of The Woodlands Convention and Visitors Bureau and director of community relations, said The Woodlands can rely on commercial growth for economic success. “Ongoing commercial growth within the township and projected significant population growth in the region will contribute to continued economic growth for the community,” Wolda said. The hard data supports The Woodlands as well. Niche, the neighborhoods and schools rankings site, based these best city rankings on real statistical analysis as well. Cost of living, the percentage of residents with a college degree, average commute time, crime rates, public school ratings, resident reviews and weather are some of the major factors. Over the past 43 years since the Village of Grogan’s Mill opened in 1974, George Mitchell’s vision has come to life with the development of each of the eight residential villages that make up The Woodlands. Developers modeled the layout of the new community after similar neighborhoods around the country. Among the key planning committee members was Ian McHarg, a landscape architect specifically sought out by George P. Mitchell because of his unique design principles. McHarg embraced and applied a design that would minimally affect the area's woodlands and wildlife, according to a University of Massachusetts essay authored by ecologist Kristine Swann. "McHarg looked at The Woodlands as an opportunity to apply his theory of ecological determinism - allowing the ecology of the land to determine what development could and should take place," Swann explained. The Woodlands Township Board joins the entire Woodlands community in remembering The Woodlands founder George P. Mitchell, honoring his life, and celebrating his dream that became The Woodlands. A testament to his vision, Mitchell's original plan for The Woodlands continued to be implemented even after he sold it in the late 1990s. He intentionally left a 1,000-acre parcel near the entrance of The Woodlands for a commercial district. Others recognized the value. "Many developers would have developed that first because it was closest to the highway and most accessible," Galatas said. "But George saw a bigger picture and he saw a town center that would serve not only The Woodlands but all of north Houston."